Just one more week to catch the dining deals during DineLA; a biannual fine dining event presented by the Los Angeles Tourism and Convention Board. 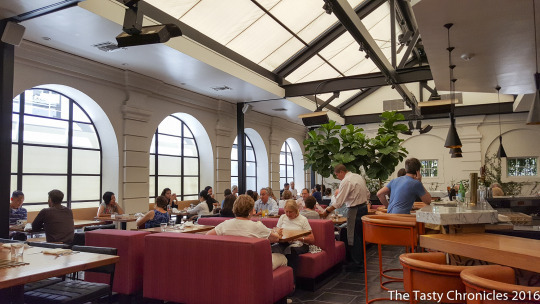 DineLA features discounted lunch and dinner menus by many Los Angeles area restaurants. Just the other day, it was an overdue lunch in Downtown Los Angeles with friends who were just as curious as me to check out the lunch scene at Redbird; a restaurant emphasizing on modern American cuisine. My, oh my. It has been a while since I actually ordered from a DineLA menu. Come to think of it, it has been three years at least. Since the inception of DineLA, I’ve notice that restaurants have gravitated from highlighting dishes from the regular menu to serving a “special DineLA” menu of dishes not on regular menu. While some special items were actually magnificent, I never saw them again when I returned. Redbird’s DineLA menu caught my attention because they were featuring dishes currently on the regular menu. I applaud them for doing this. Free-flowing Prosecco and cocktails were the drinks of choice during lunch with the gals. I had a Sake-cocktail called Little Tokyo; a drink named after the location of Downtown Los Angeles where Redbird calls home. It’s concocted with Pearl Sake, Cappaletti, sweet Vermouth, and Yuzu. 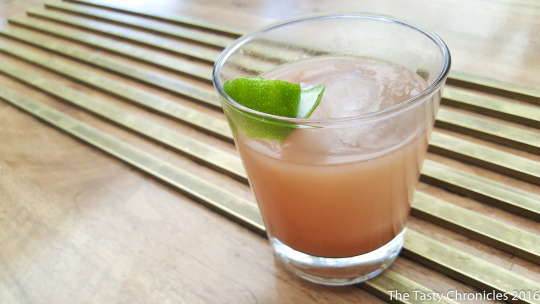 The taste was far from the sweet side, but more on the herbally yet slightly bitter side. 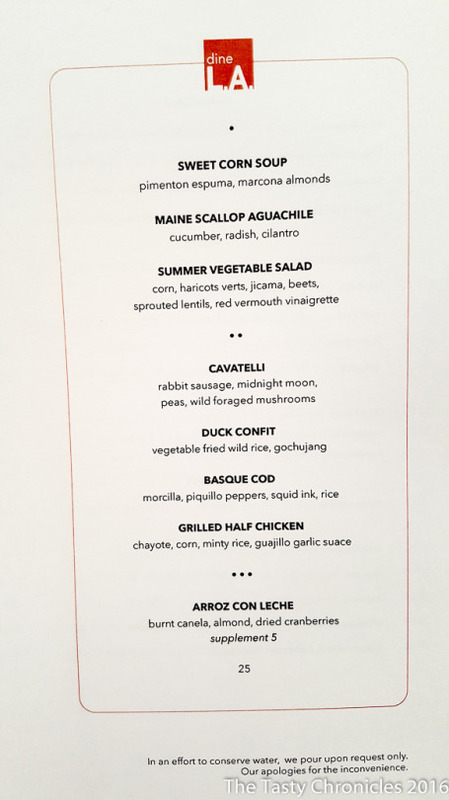 Since it is summer, the restaurant featured a two-course $25 DineLA menu with a $5 supplement for an additional third-course (dessert). We opted to try everything on the DineLA menu, but skipped the Grilled Half Chicken. As the food came, I noticed that the portion size made it easy to share the dishes between the three of us. Pictured above is the Maine Scallop Aguachile. 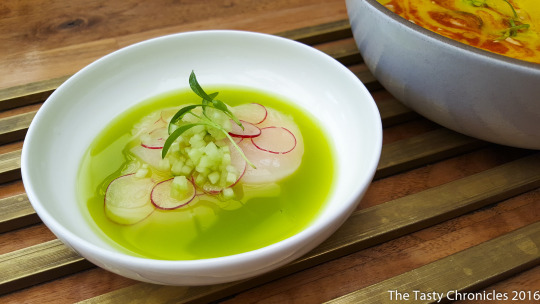 The scallops were fresh and slightly tangy after floating in the lime juice. Redbird accentuates seasonal ingredients; a popular thing among restaurants in Los Angeles. At the present time, our local Farmer’s Markets are flourishing with locally grown summer produce, which makes any summer fine dining menu exciting. My friend got to the Sweet Corn Soup before I could take a decent food photo. 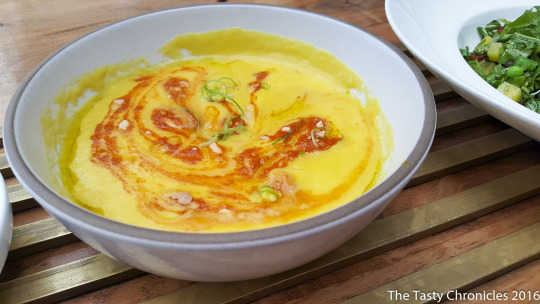 Despite the avant-garde appearance, the soup with Pimenton Espuma and Marcona Almonds encapsulated the very essence of the summer corn. Sweet and vibrant. 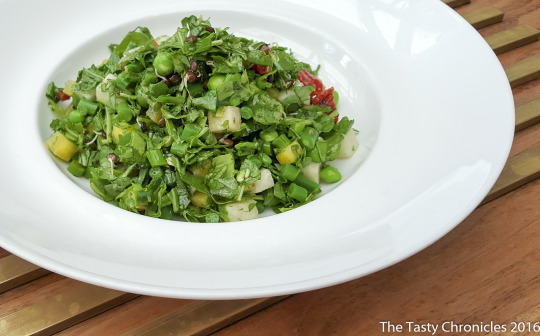 English Peas replaced the corn in the Summer Vegetable Salad at Redbird. This salad was a wonderful medley of summery produce like haricot vert, jicama, and golden beets. Sprouted lentils were also tossed in along with a red vermouth vinaigrette. This salad was the epitome of fresh. It would have tasted perfectly fine without the vinaigrette. The Basque Cod is a fascinating dish. I believe the cod fish was poached in a squid ink, which is why it’s black in color and tasted a lot like squid. It was perfectly cooked as the opaque flesh was juicy. 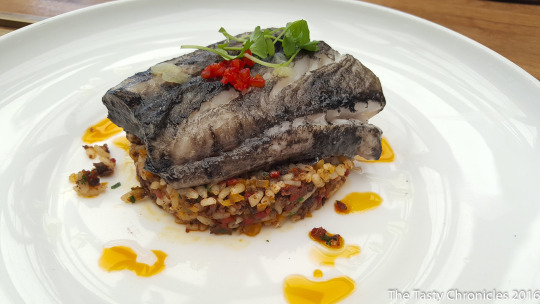 Accompanied with the rice, morcilla, and piquillo, the overall flavors enhanced the interpretation of the cod. An endearing seafood dish. It was nice to enjoy a fish dish that is wasn’t raw or pan fried for a change. I had a what I thought was the best pasta dish with rabbit a few months ago at Spring; a French restaurant also in Downtown Los Angeles. Then I had the Cavatelli pasta with Rabbit Sausage at Redbird. What a phenomenal summer pasta dish! Everything incorporated in this pasta speaks summer. The wild mushrooms with Rabbit Sausage that stole the show as the browned, crispy little bits adds a tasty depth. Redbird’s Cavatelli pasta with Rabbit Sausage is now my #1 favorite Pasta Dish in Los Angeles. 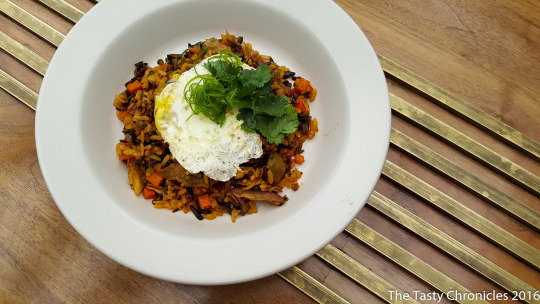 The Duck Confit was more of a Korean-inspired Fried Wild Rice with pieces of duck confit and vegetables. It was likeable, but it was unfortunate that the fried egg was overcooked. That runny yolk was desperately needed to bind all of the ingredients together. The last course was the Arroz Con Leche. 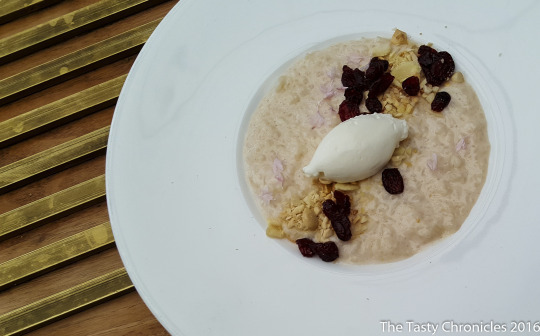 A simple yet lovable dessert with burnt canela, almonds, and dried cranberries. It was subtly sweet. As I predicted, I’d return again to relive this dining experience especially since these dishes will be available after DineLA Week. 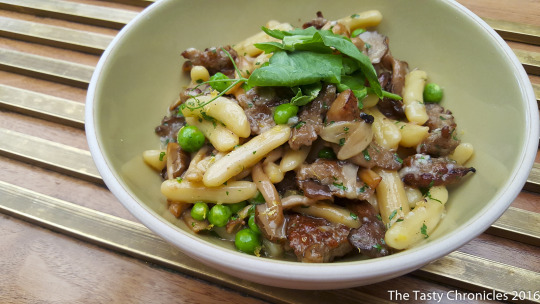 The summer menu at Redbird is an awesome one and the Cavatelli pasta with Rabbit Sausage is worth having again before summer is over. Reservations required. Some walk-in accepted. Credit cards accepted. Full bar. Valet parking. Paid parking lots within walking distance. Limited metered street parking.